Two years ago, Shadow Warrior got an odd piece of DLC that had players clean up after Lo Wang's bloody battles. 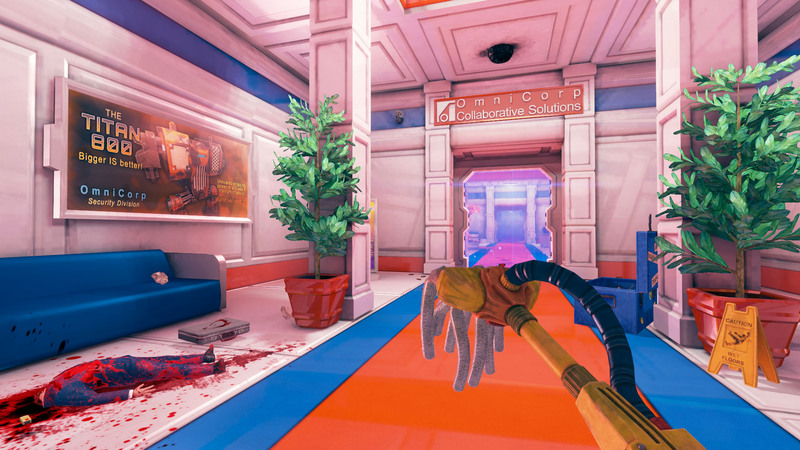 Now, Viscera Cleanup Detail has grown to become a full standalone effort, with the first-person janitorial game having just come out of Steam Early Access. To learn more about how the game has grown since 2013, Shacknews spoke to Runestorm's Arn Richert. A number of fall releases are expected to clean up across digital retailers, but only one game is taking that expression literally. 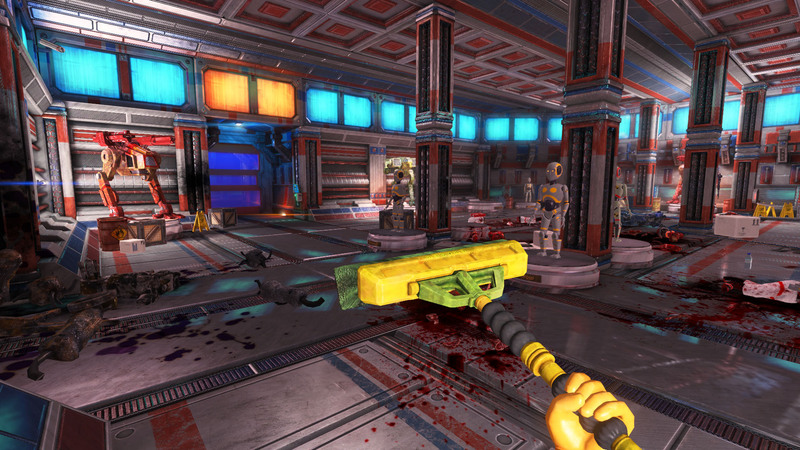 For followers of the PC gaming space, this is likely not the first time they've heard about Viscera Cleanup Detail. This is billed as a first-person janitorial game from developer Runestorm, which eyes the next logical step after a chaotic clash between the forces of good and evil. That next step being, who cleans up the mess? Viscera Cleanup Detail first started life as a standalone spin-off of 2013's Shadow Warrior before branching off into its own game. The game spent the past several months on Steam Early Access and has recently been issued as a full release. To learn more about it, we spoke to game designer Arn Richert. Shacknews: I've seen Viscera Cleanup Detail in some form for the past couple of years, including as an add-on for Shadow Warrior and as a holiday effort. How exactly did this idea come to be? How did you come up with the idea for this game? Arn Richert, Runestorm: The idea was born from a dinner-table discussion we were having following the release of our first game, Rooks Keep, which wasn't doing well. We were wondering what to do next, and as we rattled out various crazy ideas, somehow the idea of the player being the person who has to come in and clean up after some sci-fi event you'd see in many games or movies was suggested. It immediately struck a chord, and we eagerly expanded on the idea as we sat there and talked about it. That night, we set to work on the prototype, and 10 days later, VCD was alive and up on the net for all to see. Later on, we also started to see how the platform could easily be used for any number of scenarios, hence the Santa's Rampage, House of Horror, and Shadow Warrior add-ons. 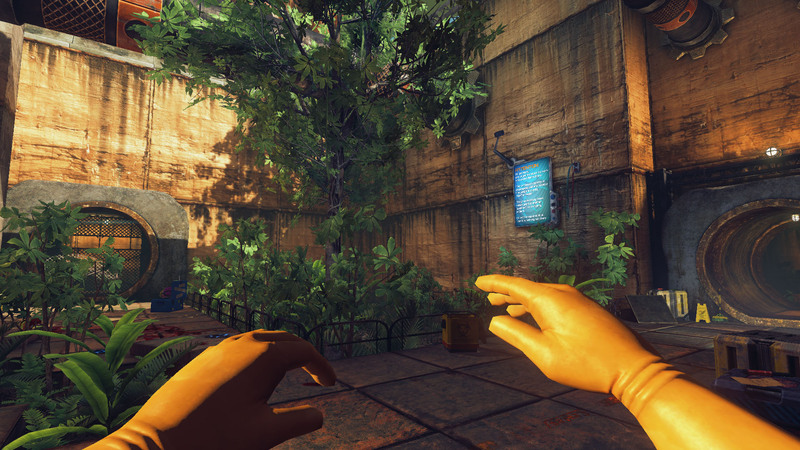 Shacknews: In what ways has Viscera Cleanup Detail changed over the course of its development? Is the game that's out now the same as what players saw with the Shadow Warrior and Santa's Rampage releases? Richert: Well, the gist of the game is essentially the same, yes. You come in and clean up a scenario, figuring out the best way to go about that, depending on the map. We have since added new tools that the spin-off titles don't have (but will get soon enough as we merge them into the main game and update them), such as the broom, welder, and vendor machine. As to how the game has changed; it has quite drastically from our initial, scrambled idea that we had at the table that night. One of the biggest additions that the first plan didn't involve, was the expansive physics system. But as we developed the prototype, that accidental addition became an essential staple of the game. The player being able to knock over their own bucket, pick up crates and actually put viscera inside a bin became permanent additions. That last one about putting objects in the bin? That is possibly the single trickiest and most demanding part of VCD from a technical standpoint. Sure, physics are cool on ragdoll bodies and crates, but taming them to work like that? Ugh! But beyond that, we did expand on the humor element to offset the grisly horror of it all, and played up the environmental narratives considerably from the initial prototype stages, which were simply generic husks. Shacknews: The broom seems like the common way to clean up a mess, but what are some of the other ways to clean up stages? Richert: Well, when we're feeling like doing the company proud, we'll start by mopping up all the blood, then picking up body parts/viscera and then finally the less 'messy' objects such as trash and boxes. Then you can round that off with restocking med-kits and welding bullet holes. You can also go through and start by picking everything up, but then you'd have to mop up all your own footprints. You can use the welder to melt down many of the objects into a small pile of... well, melted junk. But that comes with the increased risk of fires and scorch-marks. Shacknews: How messy do these stages get? I already imagine alien entrails all over the place, but what are some of the more difficult substances to clean up? Richert: Bullet cartridges are always much maligned by the cleaning staff. Poor little things. Those are especially unwelcome in the stage where you must repair some sentry guns that may just turn on you if you're not careful. Not only do you suffer an embarrassing death, but now you have to clean up the cartridges that killed you, too! Luckily, the blood splats are little match for your space-mop, but they make up for that with sheer numbers. Wrestling large dead aliens or body bags into the incinerator is also something of a challenge. But a good employee will persevere and overcome! Shacknews: VCD also features co-op. What are some of the different ways that teammates can creatively clean up messes? Richert: Well, when players are not trying to sabotage each other and hinder progress for the team with their tomfoolery, it works quite well! But in seriousness, it can be quite collaborative! Someone to mop and another to pick up the objects, whilst yet another player could be bringing new bins and buckets and incinerating the old ones for maximum efficiency! Helping each other reach higher places is another key advantage of co-op. Jump on a box and let a fellow player lift you up to clean some out-of-reach splat! Shacknews: Can you explain the Steam Workshop integration? What can players create using Steam Workshop? And what have been some of the best custom creations you've seen thus far? Richert: Presently, new maps are the primary goal of the Workshop. We might be able to get the game source code out in the not too distant future for other kinds of mods, but maps are the current output of the Workshop. And indeed, new maps were the force driving Workshop integration in the first place, as I think the scenarios are the cornerstone of VCD. Fortunately, Unreal's Kismet system allows all kinds of interesting interactions to be created by the level designer, and some of the maps on the Workshop do make substantial use of it. Shacknews: What made now the ideal time to come out of Steam Early Access? What made the team decide that the game is ready to go? Richert: We'd planned early on in the year more or less what we'd want in and done for the final version. And then we tried to get all of that done, much of which took longer than expected, of course. The main features, the maps/environments, etc. This exact release date is what we forced ourselves to aim for to get it done. We wanted VCD to be considered 'complete' by the end of the year, so leaving a month or two after release was something we wanted to have to just make sure that everything was in order. Patches could be made, extras could be added, etc. It was content complete for a while before that, and major features soon after. We wanted to end the year with the game launched and where we were happy with it. It did end up with quite a bit more than we were initially going to have. Shacknews: You've noted that you'll still be focusing on releasing fixes, as well as a few other features. You just released the Halloween House of Horror DLC. What is the team focusing on next for VCD? Richert: First things first! Sort out the Mac build and get it to a point where players that want it can get it, merge the spin-off titles (Santa and Shadow Warrior) into the main game and patch fixes here and there. Also, I'd like to add a couple extra maps over the coming months (free updates). Beyond that, we're not sure yet. Viscera Cleanup Detail is available now on PC. Huh. I thought the Shadow-Warrior tie in expansion in came later. I remember watching someone stream the one of earliest versions of this game and it was a generic sci-fi shooter setting. It did exist and was being worked on before the Shadow Warrior thing came out. The Shadow Warrior thing was always intended as a cross promotion to advertise both games. It even had playable prototypes out before the Shadow Warrior one came out. I dunno why this article is making it seem like the Shadow Warrior thing is what came first other than the fact that it is the most likely thing that people heard of the game first. This is the earliest reference I could find (July 2013), it looks like it was before the Shadow Warrior thing ( https://www.youtube.com/watch?v=Yq8Ghej--8A ) but I think the first version on Steam was the Shadow Warrior thing. Haha. Looks like they have an Event Horizon level judging by the trailer. I played a couple of hours of this game and it was oddly satisfying. Really shows you the fruits of your labor. SOUNDS PRETTY GOOD TO ME"
You know the first iteration was not the Shadow Warrior version?